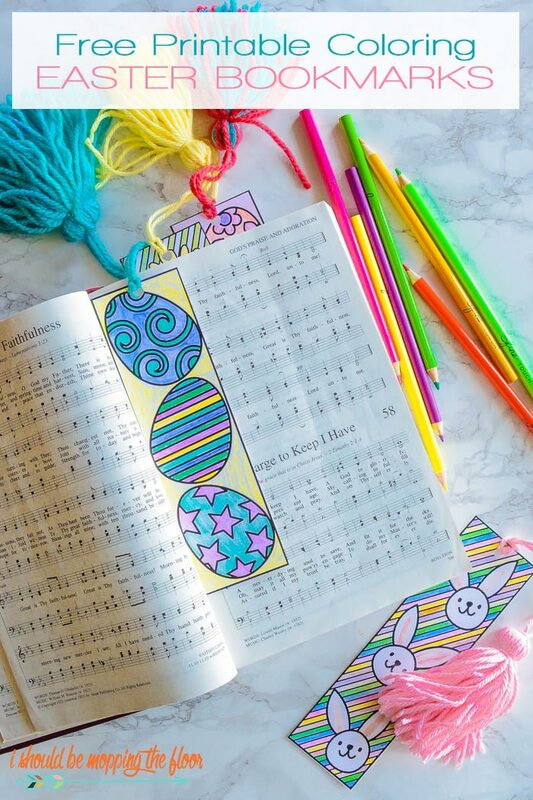 These Free Printable Easter Coloring Bookmarks are perfect to hand out to friends, neighbors, classmates, or even to pop in the Easter baskets with some crayons. They'd also be fantastic to use in the classroom for a lovely, spring activity. Grab yours below. My kids love a good bookmark...but one they can personalize? That's even better, y'all! These little numbers offer lots of creative options for kids to color until their hearts' content. They can even be embellished, too. 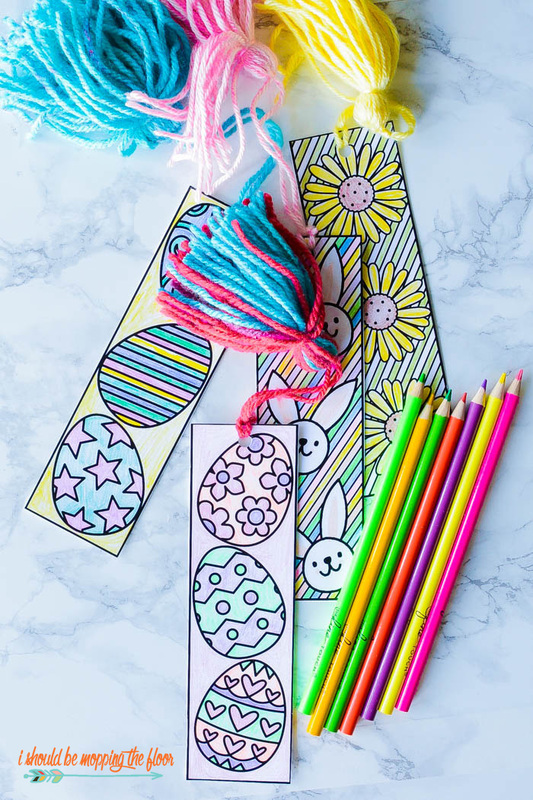 These free printable Easter coloring bookmarks are really sweet for grown ups to color, too...kind of therapeutic, really. There are four designs available below. Any other grown ups out there enjoy coloring? I could literally do it for hours. I have several coloring pages on the blog and often print one out for a little bit of inexpensive therapy. 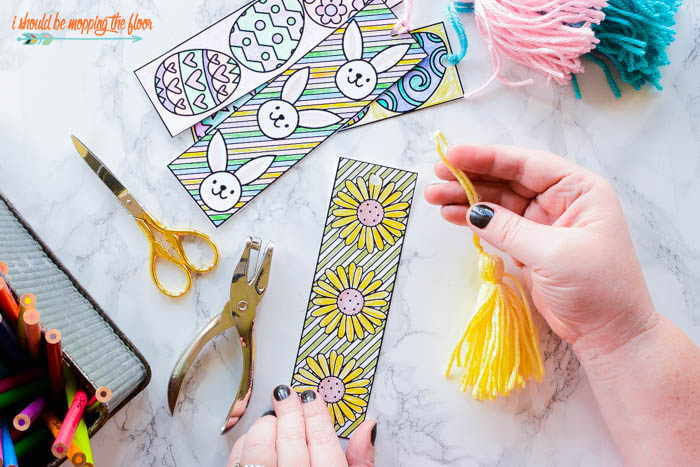 But these Easter Bookmarks are seriously my favorite designs...super whimsical and fun. And these bookmarks make excellent gifts, too. They're easy to personalize by coloring for your recipient. Or better yet, gift them alongside some colors or colored pencils so your friend can enjoy some coloring fun, too. Download your Easter bookmarks here or through the alternate link options below. If you have any downloading issues, check out my helpful tutorial here on both download and printing. Be sure to print your bookmarks onto white cardstock paper. Regular paper is too flimsy and thin for these (and it will curl on the edges when cut into bookmarks). Grab a ream of white cardstock here on Amazon (that's where I purchase mine!). You can use the black and white or grayscale functions on your printer when printing these out. It will save you ink. Cut your bookmarks out around the outer black outline of the designs. 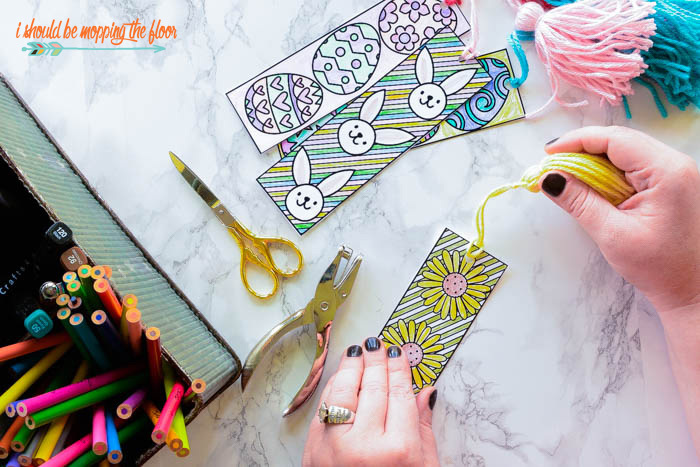 These bookmarks are so cute when they're dressed up with a yarn tassel. You can buy inexpensive, premade tassels here on Amazon. Or, if you're feeling crafty, do like I did and make your own. 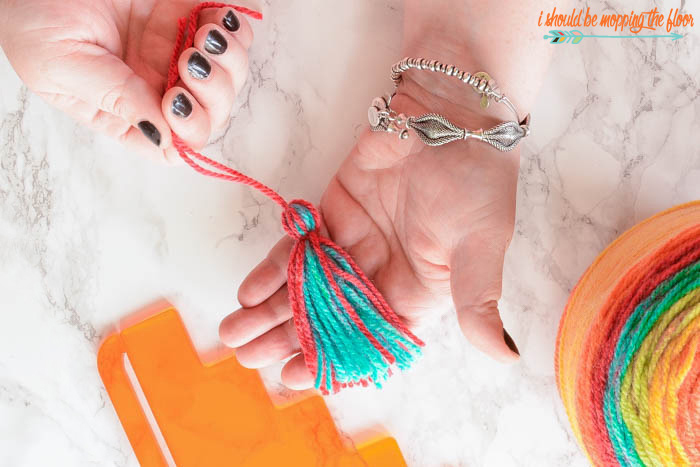 Check out my complete, step-by-step tassel tutorial here or in the video below (they're actually kind of addictive to make). Use a standard hole punch when you're attaching a tassel (be careful not to punch too close to the edge so the weight of your tassel doesn't rip the hole). Then, do a simple cow hitch knot (I seriously looked up the proper name for ya!) to attach your tassel to your bookmark (pictured below). Wikihow has a simple and easy-to-follow tutorial here on a cow hitch knot. I like to give my tassel a little fluff after it's attached to its bookmark. The links to download these bookmarks are below the printable image. 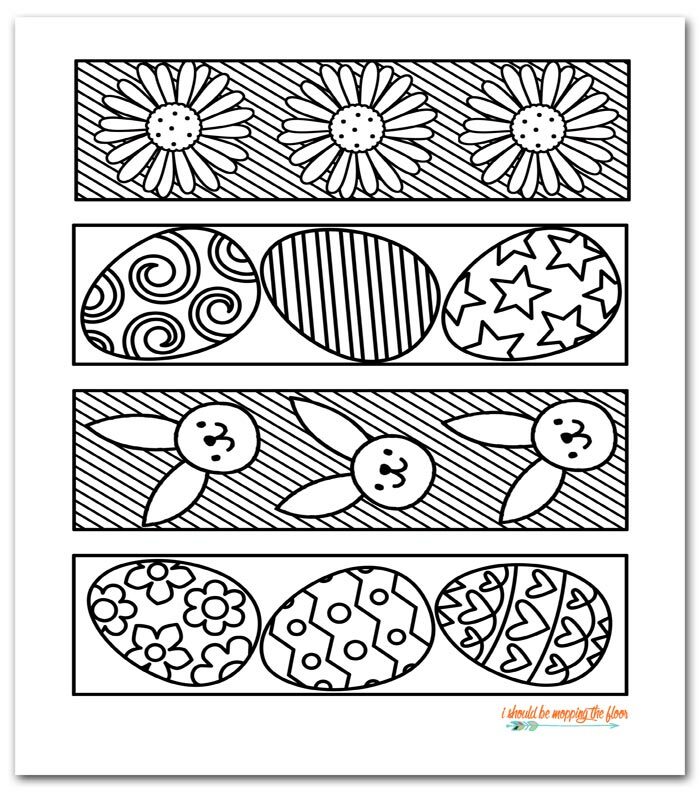 Download these free printable Easter Coloring Bookmarks here. If the above link doesn't work properly for you, try this alternate (Dropbox) link here, instead. Looking for More Easter Printables? My Free Easter Bunny Printable Gift Tag comes in blue or pink. It's perfect for springtime gifts and Easter basket labeling. My Free Printable Easter Bunny Silhouettes are always popular this time of the year. And this Free Printable Happy Easter Card is a reader-favorite to download. This Cottontail Farms Easter printable from Clean and Scentsible is so adorable. 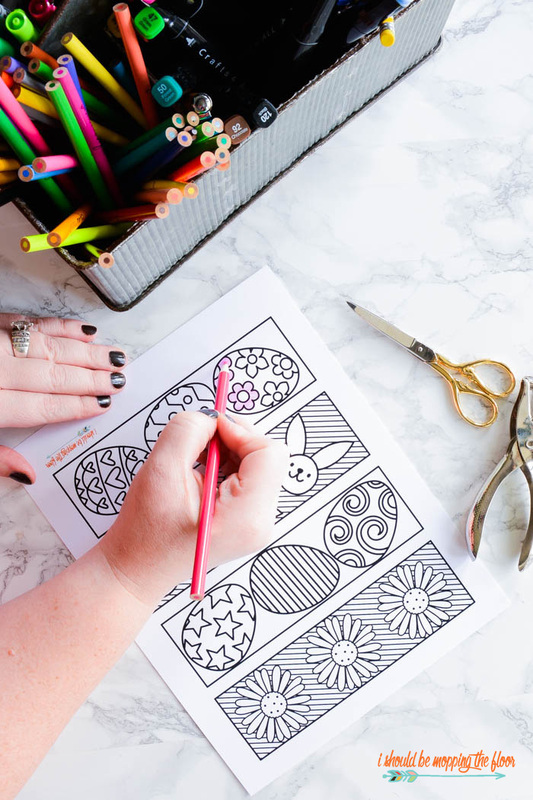 Trail of Colors has a full-sized Easter Coloring Page.